All that stuff shown above is a proposed $300 million development with 550 housing units, 650,000 square feet of retail space, and 2300 parking stalls, on a 10-acre site at Dearborn and Rainier, currently occupied by Goodwill. It’s a big one, guaranteed to be controversial, and interestingly, the two most vocal citizens groups have come down on opposite sides of the debate. Go Dearborn Street supports the development, in short, because they believe it will revitalize the neighborhood. They have been accused of being shills, but on their web site they deny any connection to the developer. When I first heard about this project I was sympathetic the the concerns raised by DSCLN, the 2300 parking stalls in particular (when, exactly, are we going to begin reigning in car-oriented development?). And I generally prefer prefer small independent businesses over big-box. On the other hand, I appreciate all the arguments supporting urban infill on this site, and sure, it might be convenient from time to time to have a Target nearby. I’m totally waffling. If you’re a design wonk, take a look at these preliminary plan drawings by Fuller Sears Architects (big pdf – right click and save target or open in new window). It’s remarkable the amount of building they’ve got stacked into the site. On the west half they’ve got big-box topped with three parking decks topped with more big-box topped with three floors of housing. Dang. Posted by dan bertolet on	Monday, December 10th, 2007 at 12:53 am. You can follow any responses to this entry through the RSS 2.0 feed. You can leave a response, or trackback from your own site. I like this project. I agree that it’s probably over-parked, but this is not a pedestrian area, and I don’t know if it ever will be. If you’ve ever tried walking down there, you’ll see what I mean. It’s not a pleasant place for a stroll. For this reason, smaller retail would struggle here without larger format stores to draw people in. People go to larger format stores and usually walk out with large amounts of goods, so having parking here is appropriate. I like this project because it showcases what we should be going for. A developer, a non-profit, and the city being creative in retaining what would be a difficult tenant to sustain (Goodwill), locating a big box store in an urban area (cutting down auto time to places like Aurora), bringing in another grocer, offering subsidies for small businesses, and bringing both market rate and affordable housing to an area that isn’t exactly a residential slam dunk. We can always say, “there could have been more,” but I think we need to recognize that there is tremendous value being offered here. This is not an easy project to make happen. This project is within the City Center where the overall goal is to deemphasize auto-use – this project does not do this as it currently stands. It is an inappropriate development type for the city center – it belongs in Bellevue, not Seattle. I agree that this area currently is not the most pedestrian-oriented, but that doesn’t preclude it from being so in the future. It is adjacent to very walkable neighborhoods and a vibrant commercial area, and could be a continuation of that rather than an auto-oriented commercial center with 2/3 the square footage of Northgate Mall. In exchange for the requested 85′ height and street vacations the developer should be required to contribute to funding the planned street car route up Jackson St – this development needs better transit access not 2,500 parking spaces. I beg to differ. This is not city center. This is a marginal area, at the bottom of two hills, very close to an I5 bridge, on the way to and from a lot of places, but, to quote, there really is no “there” there. I’m all for providing transit access here and creating pathways to the neighboring areas – that’s appropriate, especially if we can get residential in here. But it is a stretch to think we can locate a Goodwill/Lowes/Target here and get people to walk there. New York has a Home Depot downtown, which is great, but it’s in the middle of a magnitude of density where this works with limited parking. I would also challenge you on the idea that stores like Goodwill, Target, and Lowes belong in “Bellevue” (by which, I assume you mean “anywhere but in Seattle”) You aren’t going to stop people from buying at these stores by locating them out of town. What you will do is encourage them to drive out to these areas. I don’t see how this is positive. Mixed use isn’t just the stores that some people like – it’s the stores that everyone likes, and these fall into that category. Like I said, I do think this project is overparked. And a streetcar route here is very appropriate. But a project like this is probably at the margins in terms of the returns this investor is willing to accept. So, would you be willing to bet the street car route against the 200 affordable units? Of course, this also speaks to the larger issue: a developer is bringing affordable units and lots of housing, both well within the city’s goals, and retaining a traditionally marginal store. Why are we pinging him/her for this? If we can get the developer to pay for it without passing the costs on to buyers, than great. Let’s do it. But that shouldn’t be a deal breaker. The streetcar is something the city needs to pony up for, ultimately. It’s a benefit for all involved. When I say “city center” I mean to say center city as in the “Center City Strategy” which does encompass this property. The proposed development is not in step with the vision and goals of the Center City Strategy or the City’s Comprehensive Plan for that matter. Incindentally, the Comp Plan is entitled “Toward a Sustainable Seattle” – something this project is most definitely not. Lowe’s, Target, etc may have a place within the city – I was not implying that they don’t. I was referring more to the development type, which I would argue is more suburban than urban, meant to draw people from a large area, including luring them off of I-90 with tall, cheesy signs more fitting for a suburban context (if the city allows it). This project is not much more than a glorified strip mall, something the developer (TRF Pacific) does well. See Factoria Square Mall, Oaktree Village Shopping Center, Willows Pond Shopping Center (Puyallup), stop me before I puke. When it comes to community benefits I don’t see it as an either/or situation, but a both/and situation. The developer wouldn’t even be thinking affordable housing if it wasn’t for community pressure. Why not ask for more if the City is giving up right of way and allowing a height variance? At some point the City needs to demand development that is more consistent with our vision of a sustainable and livable city even if it doesn’t fit with the developer’s current thinking or meet their profit expectations. If this developer is unwilling to go along, then there are others who will see the opportunity. I can speak as one resident who would benefit from eliminating longer car trips to Northgate, West Seattle, or even Bellevue by going forward with this development. As it stands now, the area in question is one to drive quickly through to get from point A to point B. Its dirty and ugly. Getting people from nearby Beacon Hill, Rainier Valley, Mount Baker, Leschi, First Hill, the Central District and maybe even Capitol Hill to do their business and entertainment here would be quite an accomplisment. Having all this nearby encourages shorter, more frequent, leisurely visits, rather than a mega-shopping spree to someplace out of the area. Thats what I have to do now. Think of the opportunities to build a community that is attractive for everyone. And where are all these pedestrians going to come from? Have you been through the area? As a nearby resident I am all for this project as well. It’s a shame that those who are against are heard the most. What exactly is the ’scale and character of the area’? To me, the immediate vicinity is a pass through to Rainier V, Beacon Hill, Mt. Baker. Ideal location for retail. ‘is a threat to our local shopping districts (such as Little Saigon and 23rd & Jackson)’ I fail to see how a potential Target could effect these areas, and indeed would make them more attractive as speciality item destinations. More affordable housing in downtown core? (first of all how is this downtown…?) Nickels et all are requiring all new development downtown that exceeds certain height restrictions provide for affordable housing. And this project, as I understand it, has some baked in. This is a real doozy. Read: Cater to our NIMBYism cloaked in ’social values’ or we will make life very difficult for you Mr. Deep Pockets Developer. This kind of thinking is what keeps this area from progressing. What is the current timeline for the project? Supporters of this project: Please join our listserve! I’m sorry to think that people believe there is nothing here or that a super regional shopping mall is appropriate for these neighborhoods. The site is bounded by Jackson Place to the east – a small neighborhood of almost 800 residences (and because of multi-family zoning changes will be well over 1000 in a few years). Little Saigon, immediately to the north and east, is being rezoned as part of Livable South Downtown and the community and ID are hoping to have the area become a healthy high density neighborhood. A project that requires 25,000 automobile trips per day to keep 1/2 million square feet of formula retail big box stores in business is not smart urban design and infill and does not not fit into these growing neighborhoods. Wrapping “mom&pop” stores around the exterior is lipstick on a pig. And let’s be clear – the developer will be charging rents that very few mom&pops can afford – $40/foot or more. There is NO commitment to any locally owned stores in the project. This area of the CD and ID have not been infested with national chain stores. And the majority of the community don’t want them in. 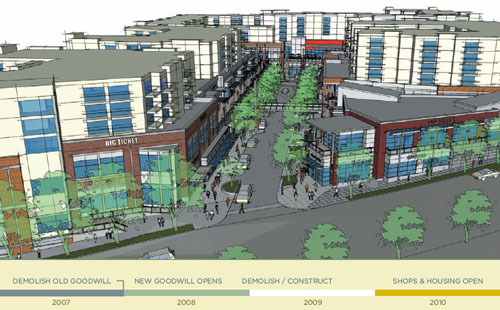 NIMBY – maybe, neighborhood character – yes, local economy – yes. For the folks that crave a Target store and cars, there are already three within 9 miles of the site. Regarding timeline – the project MUP is held up with the City – they are looking for assurances from the developer that the housing will be built (the developer, TRF Pacific, doesn’t do housing and has been trying to sub it out for quite a while). After the MUP recommendation from DPD it will go to the hearing examiner for the rezone and an EIS appeal, then to Council for consideration of the street vacations. It could go well into summer or longer before a decision.